ARIA Campus reflects a vision of the future that combines quality of life with a commitment to sustainable design. It is one of the world's largest environmentally sustainable urban communities and is committed to maintaining elevated green standards for both today and tomorrow. ARIA Campus has earned six distinct Leadership in Energy and Environmental Design (LEED®) Gold certifications from the U.S. Green Building Council. Vdara has received a “5 Green Keys” rating, the highest possible from the Green Key Eco-Rating Program and a certification achieved by only one percent of all hotels rated. Our resort and ARIA are the first in Nevada to receive a 5 Green Keys rating which is recognized by major travel services including AAA, Travelocity and Expedia. Vdara has been awarded Platinum by TripAdvisor’s GreenLeaders program. 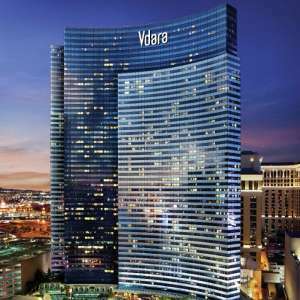 Vdara and ARIA are the only properties in Las Vegas to receive Platinum. TripAdvisor GreenLeaders Program helps travelers identify the most environmentally-friendly hotels when making travel choices. At every point, we have taken steps to achieve this goal, including the use of wood products from responsibly managed forests; high efficiency water use, both inside the building and outdoors; alternative fuel options for limousines; and an improvement of more than 30 percent in energy efficiency over standard building codes. ARIA Campus designed a highly efficient, state-of-the art 8.2 MW central plant with a combined heat and power system that captures excess heat to warm domestic hot water for hotel use. Energy efficiency measures at ARIA Campus result in 30% savings in energy use, which is an equivalent to powering 8,800 households annually. ARIA Campus conserves estimated 33% of water by utilizing efficient plumbing fixtures. More than 93% of the ARIA Campus construction has been diverted from the landfill and recycled. ARIA Campus’s 26 limousines and six Cadillac Escalades represent the world’s first fleet of luxury guest transportation to operate exclusively on compressed natural gas (CNG), resulting in lower harmful environmental emissions. ARIA Campus trained and educated thousands of construction workers, designers and vendors about sustainable construction practices and LEED. > Click to learn more about Sustainability at ARIA Campus. > Click to contact us about ARIA Campus's environmental commitment. ESPA at Vdara and Salon are engaged in the global greening movement. As part of the overall mission statement for Vdara and ARIA Campus, ESPA at Vdara and Salon Vdara have made a commitment to social and environmental responsibility. We have strategically chosen retail partners that share the same care and concern for the environment. ESPA at Vdara is engaged in the global greening movement. Salon Vdara has made a commitment to social and environmental responsibility. All of Moroccanoil's nutrient-rich, antioxidant infused formulas are made with the highest quality, authentic ingredients. Dedicated to enhancing the natural beauty of the hair.